On his last day in Uganda, he repeatedly urged Christians here to draw inspiration from their martyrs. From early morning to late evening, Saturday Nov. 28, Pope Francis highlighted in different ways the cost of Christian discipleship, yesterday and today, in this land that is known as "the pearl of Africa." He began the day by traveling ten miles from Kampala to Namungongo, where there are both Catholic and Anglican shrines. He went first to the Anglican one and was welcomed by the Anglican bishops, one of whom gave him a guided tour of the shrine. The bishop showed him the recently created museum that offers striking representations of the torture and death that the martyrs had suffered. Francis’ face betrayed inner anguish as he listened to what had happened and at the end of the explanation he knelt down in front of a tree at the spot where the 45 martyrs, both Anglican and Catholic, were tortured before being executed between 1885 and 1887. He prayed there in silence for several minutes, and when he got up he appeared to be in another dimension, one might say in a state of profound reflection. He then walked downstairs to the crypt, to pray at the tomb of the Anglican martyrs. From the Anglican shrine, Francis traveled by popemobile to the Catholic shrine to celebrate Mass for some three hundred thousand faithful gathered there at a specially constructed altar, overlooking an artificial lake in a large park not far from the actual shrine. Uganda’s Catholics were truly delighted that he had come among them, and they gave full expression to that joy during the Mass by applauding enthusiastically after every prayer and reading, and even when the pope began the Mass with the sign of the cross. It was a real festive celebration, and followed on the sense of fiesta evident on his arrival, which I mention in my report yesterday. His message did not need interpreters. 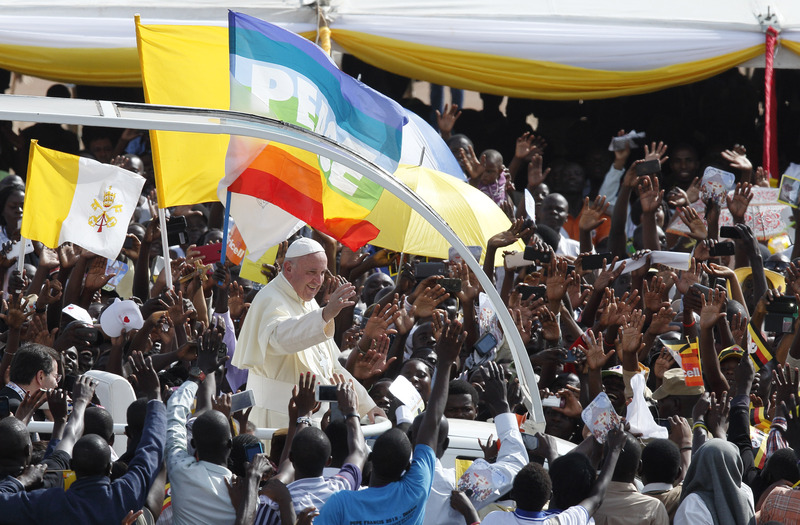 He reinforced it that same afternoon when he spoke to 150,000 young people, among them Protestants and Muslims, at a former airfield on the outskirts of Kampala, at a rally marked by excitement, enthusiasm and obvious love for Francis. After listening to testimonies from two of them—a young woman whose family was destroyed by HIV and a young man who had been a prisoner of the Lord’s Resistance Army, Francis reminded them that they have “the blood of the martyrs in your veins” and should take inspiration for their lives from that memory. He told them that with the help of Jesus they can—like those two young people—transform negative experiences in their lives into positive ones. He assured them that if they pray to Jesus regularly, then they would get that help. Putting aside his prepared text, he offered “three pillars” on which to build their lives as witnesses to the Gospel. Those pillars are: Do not forget (the memory of the Ugandan martyrs); be faithful (to that memory and to their own vocations); and pray. If they build their lives on those three pillars, he said, then the memory of the martyrs will not be something that is consigned to a museum. It is clear from what he said here in Uganda, and what he said last year in South Korea, that Francis believes firmly that the blood of the martyrs is “a seed” that can lead to change, and to the revolution of tenderness and love that he is repeatedly calling for in the lives of Christians and in the church. Pope Francis developed his message even further in the brief talk that he gave when he visited a famous charitable center at Nalukolongo, run by the Good Samaritan Sisters, which cares for more than 100 poor people—Christians and Muslims alike, with various disabilities and ages ranging from 12 to 107, many of whom have been discarded by society. After giving his talk, Francis made a private visit, far from the gaze of the media, to 10 young children at the center that are suffering from serious illnesses and disabilities. He kissed each of them, and sought to communicate his closeness to them. His witness here, as on other occasions, gives real credibility to his words and makes his message even more attractive. Francis’ visit to Uganda effectively concluded at the cathedral. There is a brief farewell ceremony at Entebbe airport tomorrow morning, Sunday, Nov. 29, after which he boards the Alitalia plane that will take him to the Central African Republic. There has been opposition to his visit here, and it has become clear that some with vested interests do not want him to come because his presence here will bring international attention to the dramatic situation in this country, which is rich in minerals such as uranium, diamonds and oil, but at the present moment it is to all intents and purposes a failed state. Pope Francis is deeply concerned at the dramatic situation of children, women and men in this country, and all along he has been determined to go to the Central African Republic in the hope that he can make a contribution to bringing a just and lasting peace here. There is no need for the parachute. His plane is scheduled to touch down at 10.00 a.m. (local time) at Bangui’s international airport tomorrow, Sunday, Nov. 29.